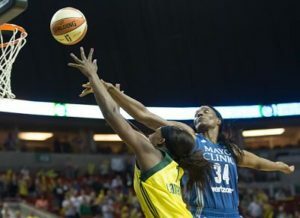 Crystal Langhorne drives past Sylvia Fowles. Photo by Neil Enns/Storm Photos. Seattle – When the Storm left Seattle on a five-game road trip at the end of July, it did so with Jenny Boucek at the helm. By the time the team returned for Wednesday’s game against Minnesota, she was gone. 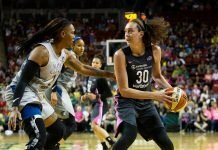 After a 98-89 win in Phoenix on Friday in Gary Kloppenburg’s first game as Storm head coach, Wednesday marked his home debut in the role, against the Lindsay Whalen-less Minnesota Lynx. And like much of the season, that match up came down to a few key moments in the game’s closing minutes. 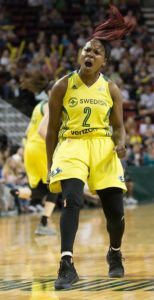 But this time, the Storm were on the right side of a close finish, as they edged out Minnesota, 62-61, in a thrilling finish. Jewell Loyd shoots over Seimone Augustus. Photo by Neil Enns/Storm Photos. 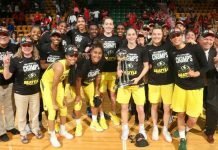 Jewell Loyd led all scorers with 16 points for a Seattle team that was without veteran point guard Sue Bird, who sat with left knee soreness. 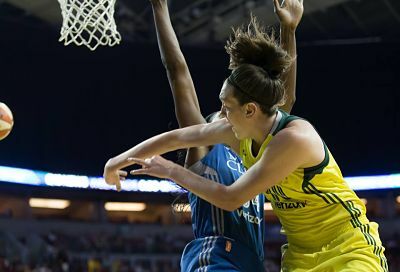 Breanna Stewart recorded her eighth double-double of the year with 12 points and 11 rebounds, while Maya Moore led Minnesota with 15 points and 11 rebounds, and Sylvia Fowles had a game-high 13 boards to go along with 13 points. Combined, that duo accounted for nearly half of the team’s season-low 61 points, as the Lynx shot just 33 percent from the field for the night. 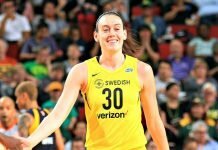 Breanna Stewart passes around Sylvia Fowles. Photo by Neil Enns/Storm Photos. Seattle had a two-point lead after one quarter and took a 36-31 advantage into the halftime break, holding Minnesota scoreless for the final 3:54 of the second period. The Lynx quickly erased that lead in the early moments of the third, and traded baskets for much of the quarter with Minnesota up 51-49 heading into the final 10 minutes. 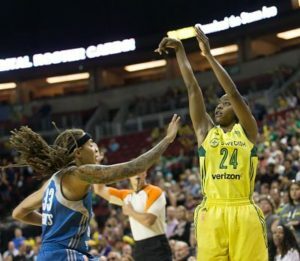 It wasn’t until a put back by Crystal Langhorne with 11.1 seconds to play — after corralling a shot from Loyd at the rim that was deflected by Fowles — that Seattle regained the lead. Alexis Peterson exults after the Storm score. Photo by Neil Enns/Storm Photos. Loyd said on the play that ended in the go-ahead bucket, she was trying to get a good look for a shot, but once the defense closed, tried to draw contact on the drive knowing there would be someone under the basket. “Lang being the most consistent player she is, she’s right in the right spots all the time,” Loyd said. Langhorne finished with 14 points. For the interim coach, there may have been some good fortune involved in the win. Crystal Langhorne shoots over Sylvia Fowles. Photo by Neil Enns/Storm Photos. A Moore jumper on the other end with four seconds left was off, and Fowles was unable to get a clean look under the basket after grabbing the rebound, before time expired. The game also had playoff implications for Seattle, as it battles for one of the final postseason spots. At 12-16, the Storm are now one win ahead of Chicago in the win column for the eighth and final playoff spot, and are just a half-game back of seventh seed Dallas. Minnesota remains atop the league at 21-5, two games ahead of Los Angeles for the No. 1 seed. The Storm and Sue Bird, left, celebrate after beating the WNBA-best Lynx. Photo by Neil Enns/Storm Photos. The Storm are back at KeyArena on Friday night to take on Kelsey Plum and the San Antonio Stars, while Minnesota returns home to play Indiana. 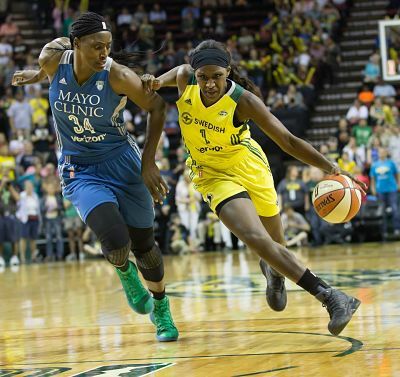 Minnesota won the first two matchups this season, beating the Storm in Seattle 100-77 on June 3, and 93-82 at the Xcel Energy Center in St. Paul on July 30. Seattle is now 2-0 in the Gary Kloppenburg era. In Bird’s absence, Noelle Quinn made her third start of the season for Seattle. She finished with six points and five assists in 27 minutes. Rebekkah Brunson left the game in the second quarter with a left ankle injury, and did not return. She was later spotted on the Minnesota bench in a boot.